So, did you know that Austin, Texas is popularly dubbed the “Music Capital of the World?” It’s probably because one of the most amazing interactive music festivals is hosted there—South by Southwest. Beyond that, people flock to many cities across Texas to celebrate excellent music. Texans are fortunate enough to live in a state with a thriving music scene, so here are our 10 favorite spots to see a live show. The Moody Theatre in Austin hosts probably one of the most consistent and famous live music shows in all the city—Austin City Limits. You can even tune into the live music shows on your television if didn’t buy a ticket to attend the show. You’re never missing out. It’s been a host to some pretty big names like Willie Nelson, Jay-Z and more! The Deep Ellum district is famous for Dallas’ live music and nightlife scene. Granada Theater is where you want to be if you like that elbow to elbow environment with a full bar and just good down-to-earth music, in an Art Deco-style venue. If you’re looking for local Texan artists to enjoy, head over to Anderson Fair in Houston. You’ll catch artists from elsewhere from time to time. Enjoy Tex-Mex eats and a beer & wine bar only. They’ve been around since the 70s so they know what they’re doing and are clearly loved by the community. This San Antonio spot is the classic neighborhood bar as it features local artists with original songs or cover bands. What better way to get to know a city than to be a part of the most local aspects of it? The Sugar Shack is the epitome of small-town-charm! Be careful walking up their oyster shell pathway, but get ready for friendly staff and a tiny stage for artists that have come by like The Black Keys. How about for some live music in beautiful coastal city, Corpus Christi? What better way to enjoy music than with sun, waves and your best of pals at Concrete Street Amphitheater? There are two different outdoor stages that are host to multiple shows at a time. San Marcos is not just a college town that parties, they’ve got quality music venues like Riley’s Tavern. Where patrons can enjoy small bites to munch on with their beverages and play their favorite tunes via their jukebox. You didn’t think we forgot about Oma Gruene’s Secret Garten in New Braunfels, did you? This town is all about being outdoors and soaking in the beautiful sunny weather. It doesn’t hurt to compliment your good time with live music and good eats. Marble Falls is known for its charm and gorgeous scenery. It’s also known for local businesses like the Brass Hall which just gets the job done to perfection! 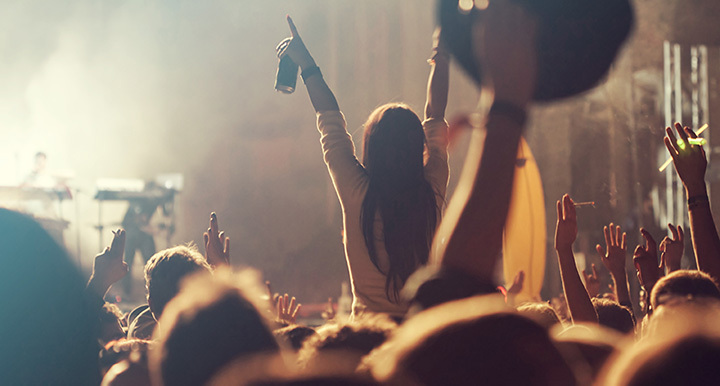 They book amazing live bands that the community loves and have great service to pair. For a variety of genres, stop by the Iron Horse Pub in Wichita Falls. Like Guinness beer? They’ve got that and other cold brews on tap for you in their Irish pub. From what the locals are saying, they’ve got the best everything for you! View more Texas Live Music Venues.